Upgrade your quilting equipment with the Studio Fabric Cutter. This premier fabric cutter was designed tough enough to handle the amazing amount of quilting done in quilt shops, fabric craft retail stores as well as the homes of experienced and prolific quilters. As dependable as it is precise, the studio fabric cutter makes quick work of cutting up to 10 layers of fabric for a variety of quilting and fabric arts projects. Up to 90% faster than rotary fabric cutters or scissors. The steel roller never needs replacing and withstands years of die cutting use. Dies cut into reuseable sheets of cutting plastic that provide hundreds of uses. NOTE: No lubrication is necessary; all bearings are sealed. AccuQuilt offers more than 60 patterns to coordinate with dies--perfect for kits. Comparing AccuQuilt Fabric Die Cutters - Studio, GO, and GO! Baby. Ebony Love of Quilt Possible! explains the similarities and differences between AccuQuilt's three die cutters- the Studio, GO!, and GO! Baby. See more videos and tips at http://quiltpossible.com. There's also a comparison chart on the site to help you decide which cutter is right for you. 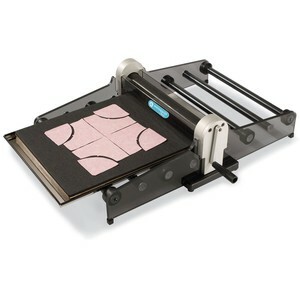 AccuQuilt Studio Fabric Cutter -- The World's Premier Fabric Cutter (50800). Ricky Tims and Alex Anderson love AccuQuilt! AccuQuilt offers quilters, fabric crafters and retailers a premiere line of fabric cutters, dies, quilting patterns and other quilt and fabric cutting solutions that help quilters quickly and accurately cut shapes for quilting and fabric crafts. GO! GO! GO!!!!! I am very glad that I purchased the go and several of the dies! This product saves me valuable time and has greatly improved my accuracy. Using the go to cut my fabric and placing it in a "project bag" with the pattern and all of the needed extras helps me to be more prepared to piece and I can switch from one project to another with ease. Saves time, very accurate, and a great tool for any quilter. I GO! GO! GO! then I SEW, SEW, SEW!!! !